As the leader in commercial controls and residential smart home systems, Lutron creates products built around the idea of convenience, control, and conservation. Take a look and see what’s new with Lutron! Lutron’s Maestro dimmer has long been a favorite of contractors and designers alike. The sleek design paired with the intuitive controls and wireless capabilities make Maestro an easy choice for a wide range of applications. The newly released Maestro C.L Pro is a phase-selectable dimmer suitable for use with LED, ELV, MLV and incandescent lamp loads. The dimmer is capable of controlling up to 500W of ELV, 400VA of MLV, or up to 20 Hi-lume 1% 2-Wire (LTE) LED drivers, and up to 250 W dimmable LED in reverse-phase (150 W in forward-phase). Large tap-switch with a rocker-style dimmer for a standard designer wall plate opening. Advanced dimming technology designed for compatibility with a broader range of high-efficacy lamps. The Lutron Caséta product line has become a standout for homeowners and renters as a “build as you go” wireless smart home system that turn any space into a smart home. 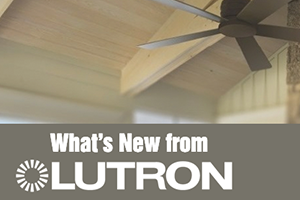 From the get-go, Lutron heard their customer’s requests for a fan controller that does more than on/off. The brand new Caséta Smart Fan Speed Control replaces an existing switch, and installs in three simple steps. Take control of your home by wirelessly changing the speed of your Homekit enabled Hunter ceiling fan from your couch, or anywhere in the world with the Caséta app. For more info click here! Lutron knows that not all projects are the same, that’s why they created Vive to be simple and scalable. The modular wireless lighting control solution works seamlessly with new and existing commercial spaces to instantly meet energy codes and finish jobs quicker than ever, and on budget. Vive consists of a wide family of products including sensors, remotes, load controls, and an available software management suite. Vive provides the flexibility to select the products you want and handle any on-site challenges with ease. Vive’s modular capabilities allow for a multi-strategy approach to accommodate any budget and performance needs now, and for the future of the building. Vive can start out as a single office space, an entire floor, or even the whole building to control lighting and shades with user friendly interfaces. Installation of Vive is simple thanks to its wireless components. Less wiring makes installation faster and with less call backs, reducing labor by up to 70%. Setup is as simple as pushing a button or using a smart phone or tablet, further reducing time and labor costs, with no manufacturer commissioning required.